Tejas Corporation is engaged in supplying Hot Dip Galvanized Nuts which have fabricated using high graded raw material to provide best durability & low maintenance. One of our most appreciated products is threaded nuts which are intended for use on external or male screw threads such as a bolt or a stud for the purpose of tightening or assembling two or more components. They are available in various types such as standard, castle, collar, slit, dome nut etc as per the requirement and specification of the clients. As we are one of the uprising organizations, we are now manufacturing and exporting a quality range of Hot Dip Galvanized Nuts all over the nations. Fabricated with premium grade raw material these products consist of high tensile strength and long lasting service. At every stage of production these products are quality checked and are completely authenticated as well. 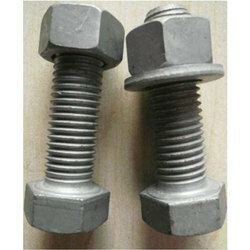 Engaged in dealing a wide range of Hot Dip Galvanized Nuts, these are made in accordance to various industrial standards to offer high functionality. These products offered by us are made from high quality raw materials to offer high consistency and long service life. We offer these products at market leading rate. GI nuts, bolts and washers of different radius and thickness. 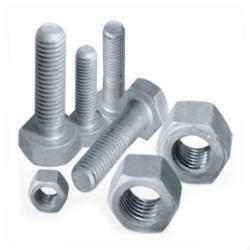 We offer a wide range of Hex Nuts, which are very helpful in the processing of various industries. Our range of hex nuts are available in the following technical specifications.